Easy to Learn Korean 1269 – Upload and download. Posted in Series	| Tagged book, download, file, He got caught with an illegally download song., I downloaded the (file, I uploaded my trip photo to Facebook., I will upload and download from the office business server., iPIN, Korean Resident ID, movie, picture, song, upload, website, 다운로드하다, 다운받다, 사무실 회사 컴퓨터 서버에 올리고 다운받을거예요., 업로드하다, 올리다, 음악 파일을 불법으로 다운받다 잡혔어요., 주민등록번호, 파일/사진/노래/영화/책 -을/를 다운받았어요. Help us with a 7 question survey. We prepared a short 3-minute survey to better understand our audience. Please let us know how we’re doing and if we’re meeting your expectations. 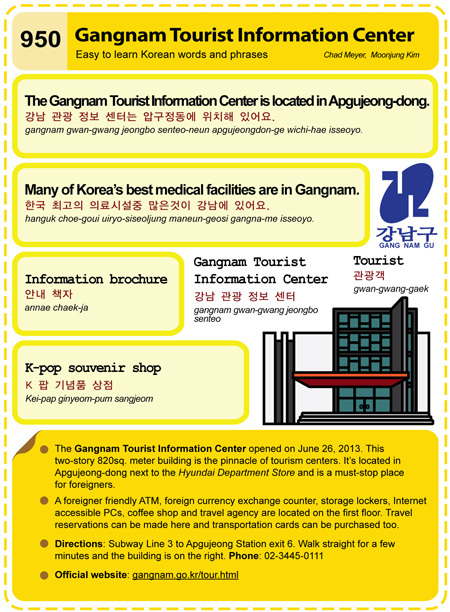 Easy to Learn Korean 950 – Gangnam Tourist Information Center. Posted in Series	Tagged Apgujeong-dong, Gangnam Information Center, Gangnam Trolley Bus, gangnam.go.kr/tour.html, Hyundai Department Store, information brochure, K 팝 기념품 상점, K-pop souvenir shop, medical facilities, tourist, travel agency, travel reservation, website, 강남 관광 정보 센터, 강남 관광 정보 센터는 압구정동에 위치해 있어요., 관광객 관광객, 안내 책자, 한국 최고의 의료시설중 많은것이 강남에 있어요. EasytoLearnKorean viewed by 110,000 visitors in 2013! Happy New Year and welcome to the Year of the Horse! We had an excellent first year at EasytoLearnKorean. 110,000 visitors came from 133 countries to see the 296 posts we made. December 10 was our busiest day with 1087 page views. The most viewed article, by far, was the Gwiyomi article. Click here to see our complete Year-End Summary. 1. Forums are now ready! Please sign up. Click the section Forums to view. 2. Easy to Learn Korean articles #700-775 have been uploaded! Click the section Gallery to view.